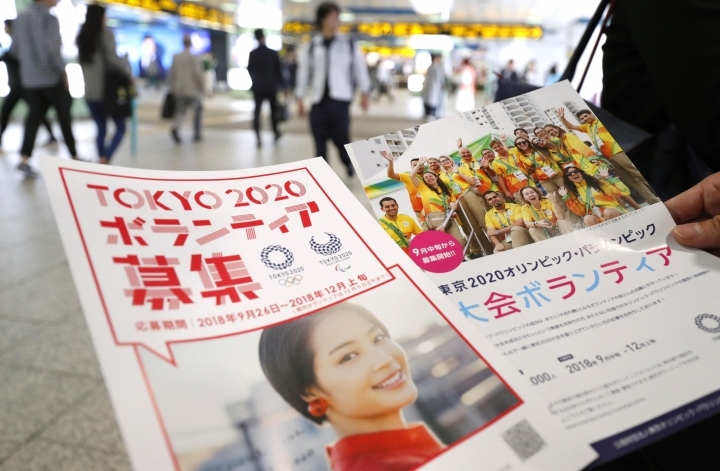 TOKYO — Tokyo Olympic organizers began their search Wednesday for 80,000 unpaid volunteers to staff many of the venues when the Olympics and Paralympics open in just under two years. The closing date for applications will be in December, although Tokyo 2020 organizers say they have not set a specific date. Olympics volunteers are unpaid and typically must provide their own lodging, but they are given uniforms and free meals on the days they work. The volunteer program has been a staple of the Olympics. Many volunteers relish the behind-the-scenes work, and many return to do it several times. But the program also has detractors. At every Olympics, volunteers sign up, get the uniforms, and then don't show up for work — or complain about being unpaid even though agreeing to those terms. The Rio de Janeiro Olympics two years ago had problems finding volunteers, particularly among the poor and working class who could not afford to work for free. "Volunteers will be an essential part of the games' success in a variety of roles at competition venues and at the athletes' village," Tokyo 2020 spokesman Masa Takaya said in a statement. Earlier this month during a visit of International Olympic Committee inspectors, a Japanese reporter told IOC member John Coates that complaints about the Olympic volunteer system were surfacing, particularly in Japanese social media. "They are hinting that it is similar to forced labor," the reporter said. "Volunteers are volunteers," Coates replied. "And they don't have to apply if they don't want to." A review of the volunteer system several years ago by the Associated Press indicated using unpaid volunteers saved the IOC and local organizers about $100 million — perhaps more. The IOC generates almost $6 billion of revenue over a four-year Olympic cycle. The IOC says about 90 percent of the money goes back to national Olympic bodies, sports federations and local organizers. "The economics of it necessitates having to have volunteers," Coates said. "They get trained, they get their uniforms. They are part of something very exciting." Coates defended the model and said "I don't think there's a case for paying volunteers." IOC members like Coates receive per diems of between $450 to $900 when they are on Olympic business, and other generous perks like paid lodging at top hotels. IOC President Thomas Bach gets no salary but receives an allowance of about $250,000 per year as a "volunteer" president. The Tokyo metropolitan government is also running a separate volunteer program to help steer tourists during the Olympics. It is reported to be seeking about 30,000 volunteers.